A sweet potato casserole recipe is great for pot luck dinners, large family gatherings, and an easy way to get this great super food into your diet. In most cases, you just toss together the ingredients and bake. In a large bowl, whip together sweet potatoes, sugar, eggs, evaporated milk, and salt. Pour into a 9 x 13 inch greased pan. Mix together brown sugar, flour and chopped pecans. Melt margarine or butter and pour over top. In a large bowl, mash the sweet potatoes. Stir in pineapple, pecans, brown sugar and butter. Bake, uncovered, at 375° for 20 minutes. Bake 5 minutes longer or until marshmallows are lightly browned. 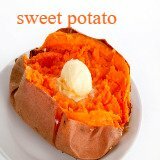 In a large bowl, combine sweet potatoes, 4 tablespoons of the margarine, orange juice and salt. Mix with an electric mixer and beat until smooth. Stir in 1 cup of the marshmallows, and spread in a 10 x 6 x 2 inch (1 1/2 quart) glass baking dish. Top with the remaining marshmellows. Melt the remaining margarine, and combine with Cracklin Bran cereal. Sprinkle over marshmallows and bake at 350 degrees fahrenheit for 20 minutes or until heated through. Yield 8 servings. Share your favorite sweet potato casserole recipe. Or, review recipes that other visitors have shared. Try one... Try them all! You can even comment and rate any of our visitor's casserole recipes.